This is a collection of Rayman related desktop themes and screensavers plus a 2-level limited edition of Rayman 2: The Great Escape. 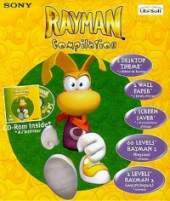 It includes a 60-level edition of the original Rayman, called Rayman 60 Levels which was exclusively released in some already existent Rayman packs in France, United Kingdom, Germany, United States of America, and other countries. It includes 60 levels (10 for each world), all of which were created by Ubisoft with Rayman Designer's Mapper and Event Editor. Each level is assigned a difficulty level: Very Easy, Easy, Medium Easy, Medium, Medium Hard, Hard and Very Hard. The main goal is to finish every level by reaching the exit sign, as in the original Rayman game. Unlike in Rayman Designer and Rayman By His Fans, the player doesn't need to collect all the Tings in a given level in order to make the exit sign appear, however doing so will still cause the victory sample to play.